What are the facts about Captain James Cook?... Most New Zealanders have a vague sense about Cook’s achievements. However, 250 years after his ﬁrst Paciﬁc voyage, Cook’s motivations, methods, signiﬁcance and legacy remain under dispute. Prof Tony Ballantyne queries how best should we understand Cook today? Professor Tony Ballantyne is an historian and current Pro-Vice-Chancellor of Humanities at the University of Otago. He has published widely on the history of the British empire and New Zealand’s colonial histories, especially the history of Otago and Southland. He is currently completing a book on James Cook and public memory in New Zealand. Tickle your brain as we tackle the big issues in a series of informal conversations, stitched together by some of New Zealand’s leading thinkers, over a coﬀee and cake or wine and tapas at Yonder (14 Church St, Queenstown). MindJam sessions are guided by guest experts, but it’s our questions, thoughts and discussions that make MindJam. Seats are free but limited, so please get your spot early, order your refreshments and be ready to join in. Friday night’s launch includes complimentary tapas. 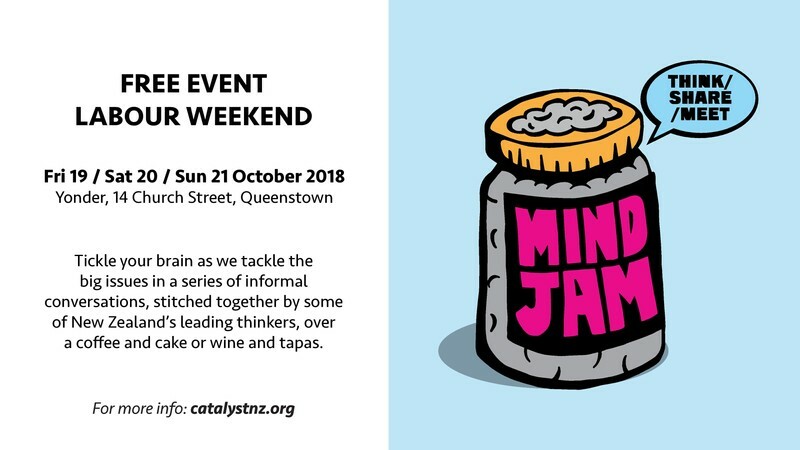 Eventbrite registration is encouraged (search for Catalyst Trust Queenstown) so we have an idea on numbers, but it is first in, first served for seats on the night. MindJam is a collaboration between Catalyst Trust and the University of Otago’s Division of Humanities.